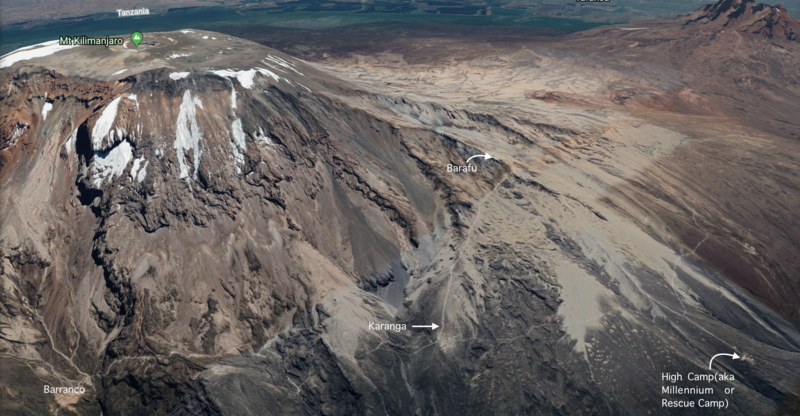 distance to the summit from Barafu Camp: 5.1 km. 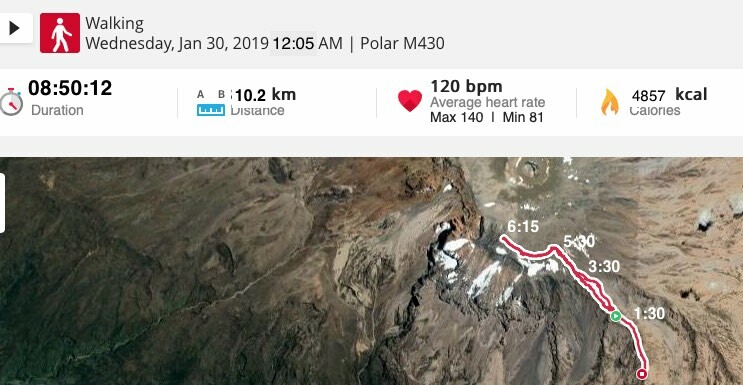 It was the climax of the trek – the walk uphill to Kibo’s rim at Stella Point and then along the rim a bit more to Uhuru Peak – but until after Stella Point all I got were the GPS track and the heart rate reading generated by my Polar M430! 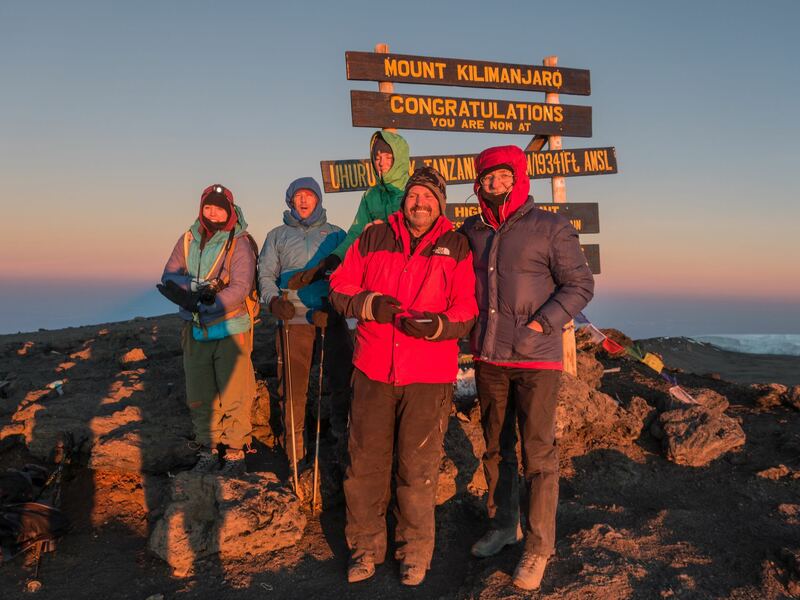 Shortly after we arrived at Uhuru Peak the sun came up and the camera came out! But of the actual ascent to the rim of the crater, only one single image – the shot below which I took at 2:45 a.m.! 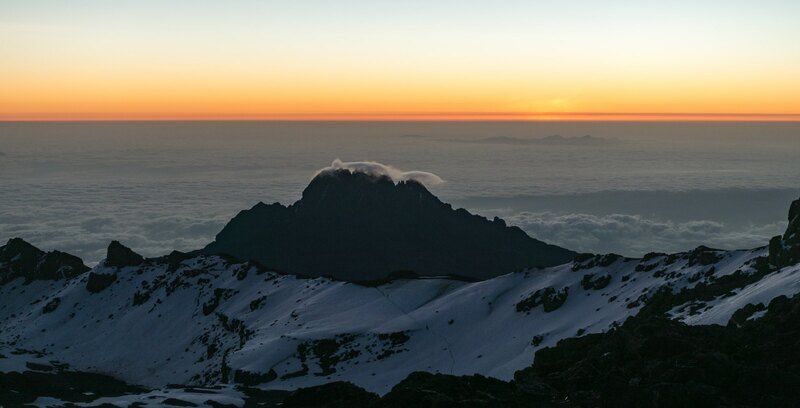 Kilimanjaro summit morning 2:45 a.m.
Wake-up had been at 11 p.m. I had slept a little and when I wasn’t I was listening to the wind blowing hard and hoping it would not be doing that for the duration of our climb up the exposed slope of the mountain. I had packed everything that was coming along for the walk to the summit earlier that evening to avoid any last-minute panic. My spare camera batteries were already in the chest pocket of my wool base layer. Before exiting my tent, I packed everything I would not be needing into the duffel and locked up the zipper. Our tents would remain standing for our estimated 9:00 to 10:00 a.m. return when we would crawl in for a brief rest. Out of the tent into the dark and over to the dining tent for a cup of tea and some cookies – I think – and then we waited for the signal to start our midnight adventure. Bottles and bladders were filled with hot water. 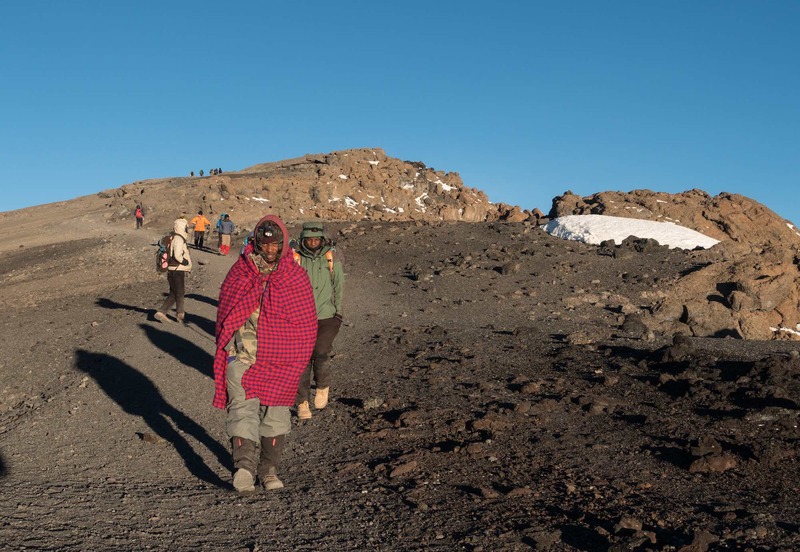 Going up with the five of us would be the three guides and – to provide emergency support – two of the lead porters, Fella and George. We started off shortly after midnight. Already visible on the slopes was a string of headlamps bobbing up and down. Every once in a while I would glance up and see a something much brighter – a star above Kibo. Mostly I focussed on the legs of the person walking ahead of me and walked into the zone of light created by my headlamp. The wind was still blowing hard from the SE and we would feel its full force every time the switchback trail turned in its direction. The temperature was a bit below freezing; I had on multiple layers to keep in my body heat! On the bottom, I had on my warmest fleece long johns, my nylon trekking pants, and my Goretex rain pants. On top, the four layers included a fleece base layer, a wool layer, a synthetic insulation layer, and my goose down jacket. My head was covered with a balaclava, a wool hat, and the two hoods of my top jackets. I would detach the goose down hood and give it to Fella soon into the walk. 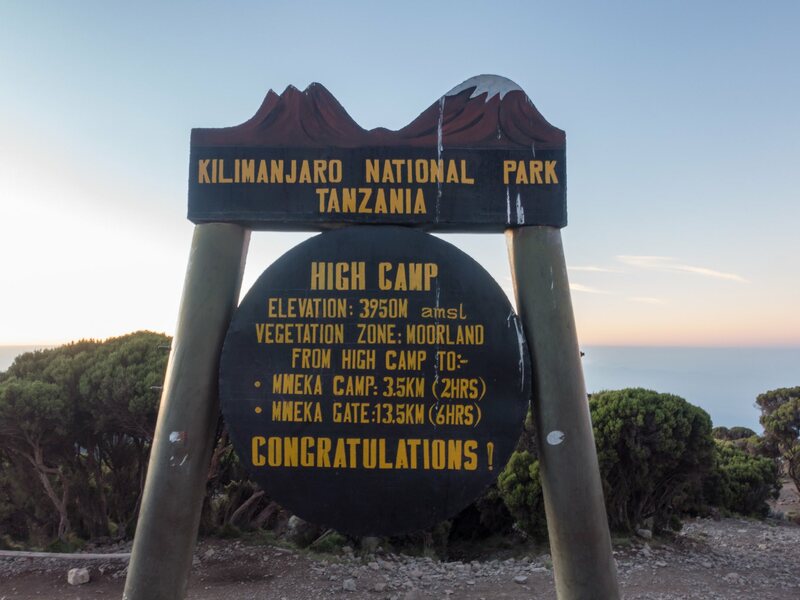 the trail from Stella Point to Uhuru Peak – just 150 meters of altitude more! We took a few breaks on our way up. Amazingly, we eventually walked past all but one of those strings of light that we had seen on our departure. In retrospect, we made really good time even if we didn’t feel it at the time! During one break I did something I have never done before on a summit hike – I accessed my workout playlist on my iPhone and started listening to some music. It really seemed to help and gave me something else to focus on. At about 5:30 we got to Stella Point, the point on the crater rim where the trail comes up to. It was still dark so I did not bother to take any photos; I figured I’d get some on the way back. 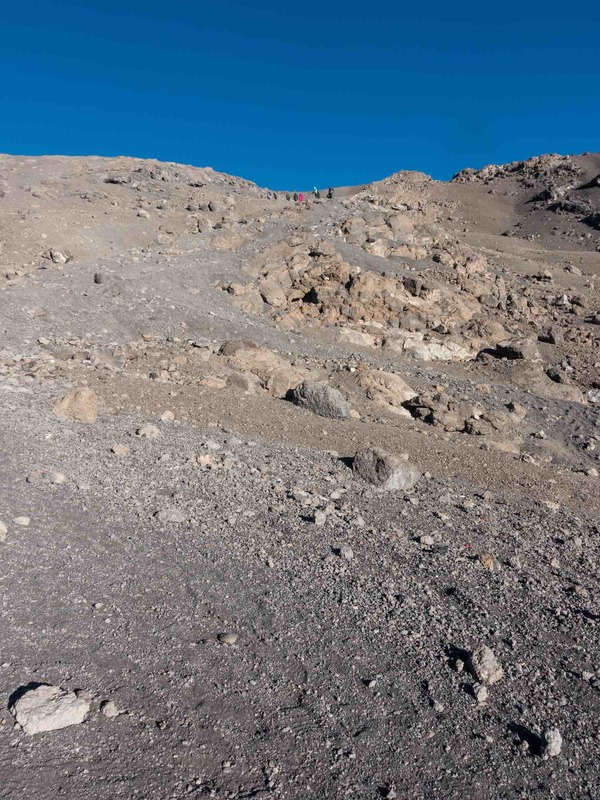 And then a bit of confusion – one of us had flopped down on the ground thinking that this was Uhuru Peak! We rested for a few minutes and moved on. Thirty-five minutes later we were there – at what all the travel brochures call the Roof of Africa! There was one other party there already. We watched as they went through a bunch of different variations of photos – of trekkers only, of guides only, of trekkers and guides, of everybody with banners, solo shots… In the meanwhile, we took in the view from the spot that we had been looking at for the past week. The sky was brightening with the just-rising sun. 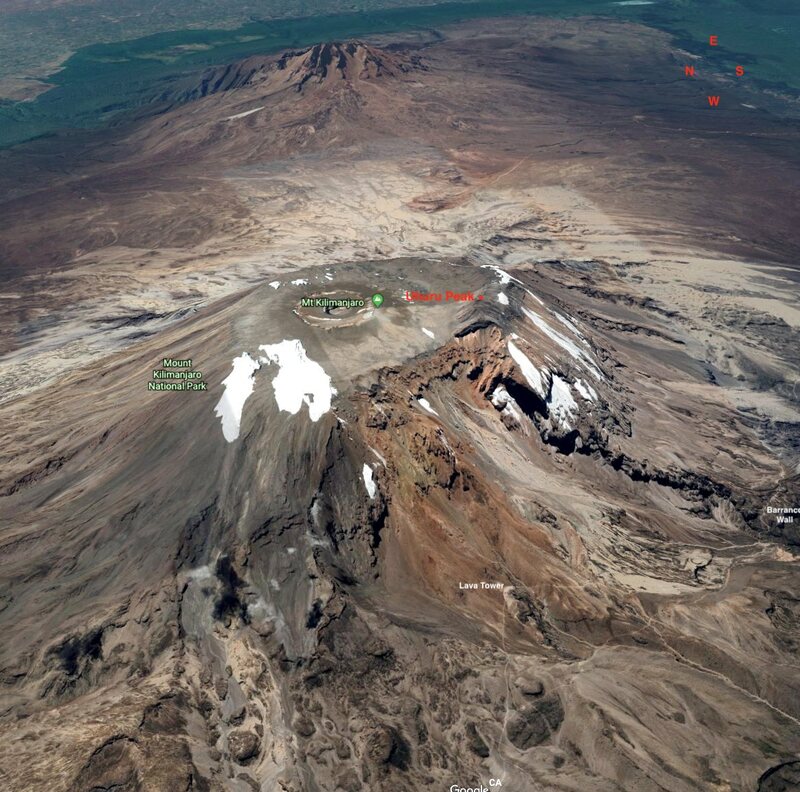 I looked towards Mawenzi, Kilimanjaro’s other peak and got the image below. 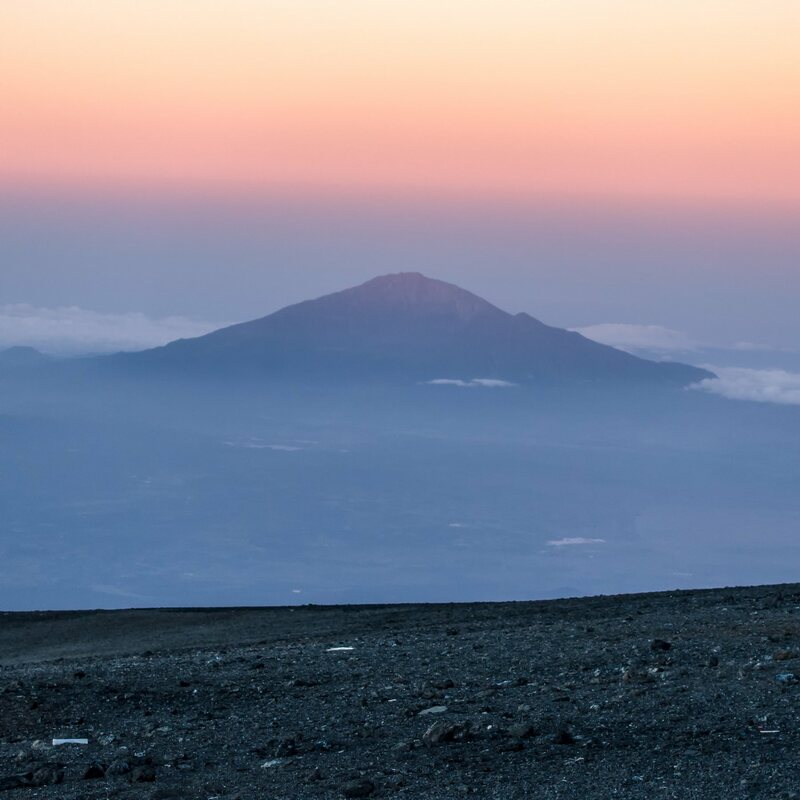 It was 6:21 a.m.
Then I turned west to look at the distant profile of Mount Meru, a trek to whose summit I had used as a warm-up for this walk to Uhuru Peak. 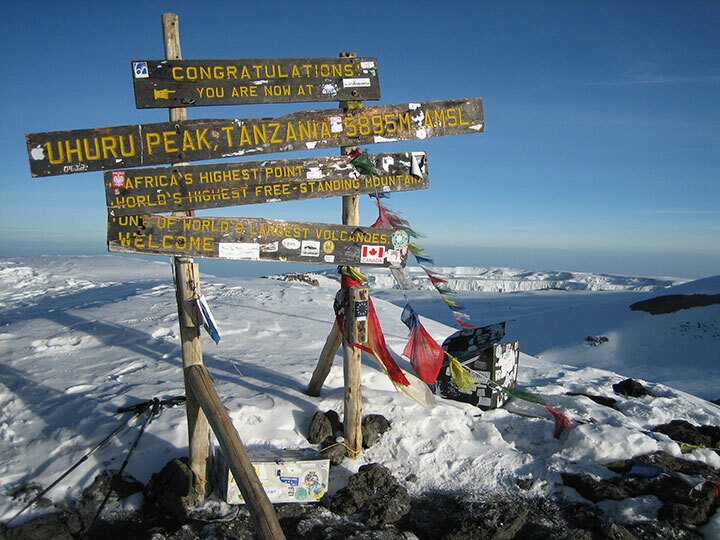 Behind us, other trekkers were approaching Uhuru Peak and the signboard that marks the spot. They would soon be waiting for us while we did a photo session not unlike the one we were watching unfold! And shortly after 6:30 – photo time for our Canadian/American summit team! We were up by the signboard for about 15 minutes in all and by 6:35 had already begun our return to Stella Point. Everyone had made it and if anyone wasn’t feeling 100% it was not evident. Our Popote crew had taken good care of us on the way up, setting a pole pole (slowly, slowly in Swahili) pace and taking on extra stuff in their packs so that ours would be a bit lighter. 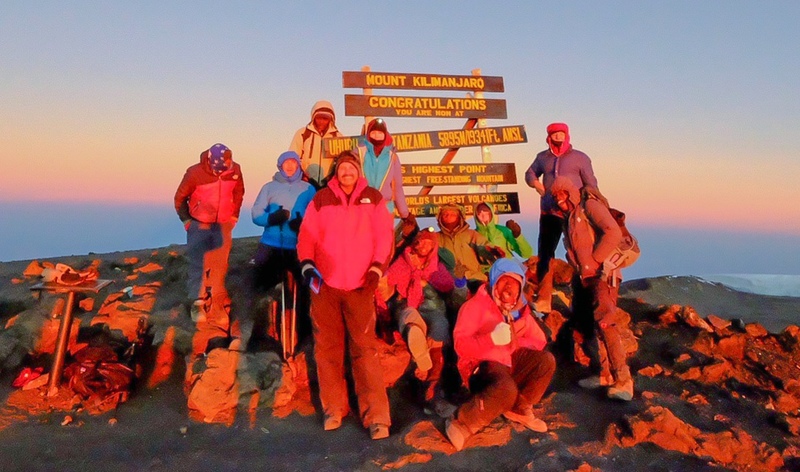 If we were feeling a sense of elation at having “conquered” Kilimanjaro – such a military metaphor that harkens back to another age – then the Popote guys were relieved not to have faced any complications and satisfied that they had helped us reach our goal. From our vantage point next to the Uhuru Peak signboard, there was a nice chunk of ice to the west, a remnant of the Southern Icefield. In the photo below it is being lit up by the rising sun. And beyond the glacier remnant, there was Meru again. 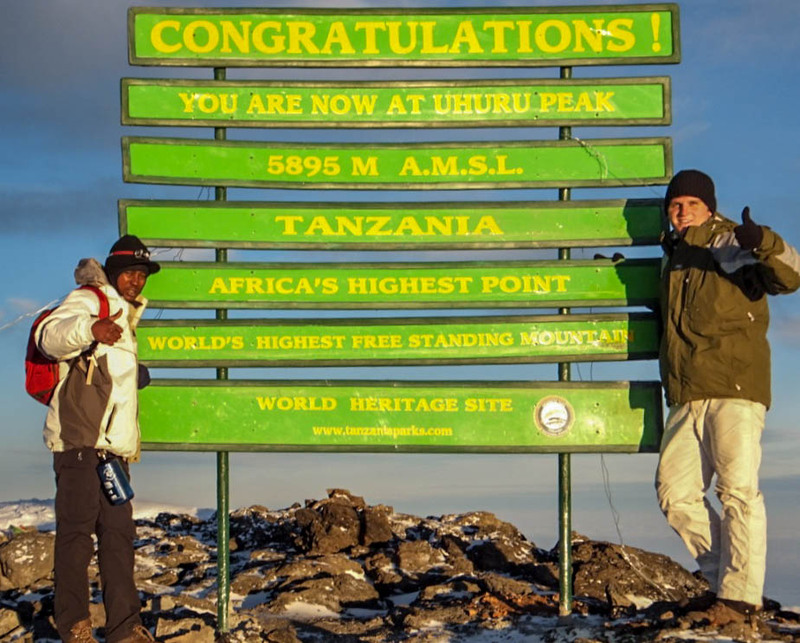 A Little About That Uhuru Peak Sign! or, at least, the one that was there before January 2012, is pictured below. It had four somewhat off-kilter horizontal boards and a registration box at its foot with a registry in it where trekkers would leave their names. Other images have a larger registry box elevated from the ground and stretching across the entire width of the sign’s support posts. Here is another image of the same sign but with the various boards much more horizontal. It may actually be the original one and eventually came to look like the one in the first image. By 2011 the sign had lost the bottom board; also, the box at the foot of the sign had disappeared. While someone looking for a unique souvenir may be responsible, it is much more likely that they got blown away in a severe windstorm. Draping the bottom of the sign in this image is a set of Tibetan Buddhist prayer flags, always a nice touch on mountaintop shrines the world over! In late 2011/early 2012, the Park officials replaced the iconic sign with the new one pictured below. It was not embraced with enthusiasm by the trekkers who made it to the top! They did not want bland and neat – they wanted the classic and iconic sign that was there before! 5. The New Old Sign! By mid-2014 the feedback had been negative enough that the green/yellow sign was removed and replaced with one which looked a lot like the first one above, right down to the askew third horizontal board. There is no registry box at the foot of the sign but someone has been good enough to fasten a set of prayer flags to the bottom of the posts. So Where Are the Glaciers? 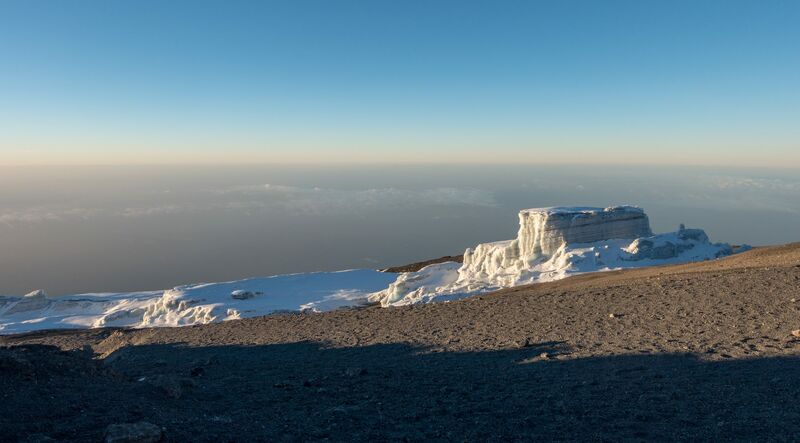 There is a bit of ice and snow at the top of Kilimanjaro’s Kibo but not as much as I was expecting. An estimated 85% of the glacial covering has disappeared in the past 100 years. Amazing to think that most of the glacial ice just turns into vapour and not the streams I pictured pouring down the slopes of the mountain! 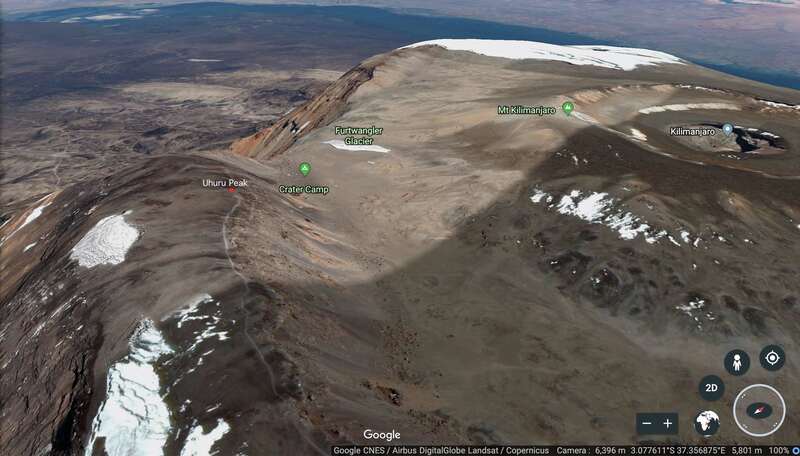 The satellite images show a large Northern Icefield and snow cover on the upper southern slopes, as well as a small glacial remnant to the SW of Uhuru Peak and the ever-shrinking Furtwangler Glacier not far from Crater Camp. 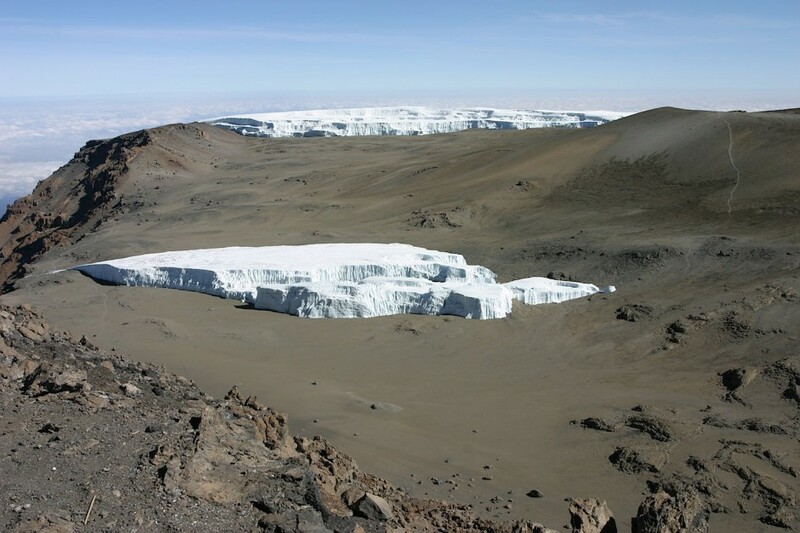 The image below is of the ice patch immediately to the west of the Uhuru Peak signboard. I had also taken a photo of it when we first arrived – see a few images above for the shot. 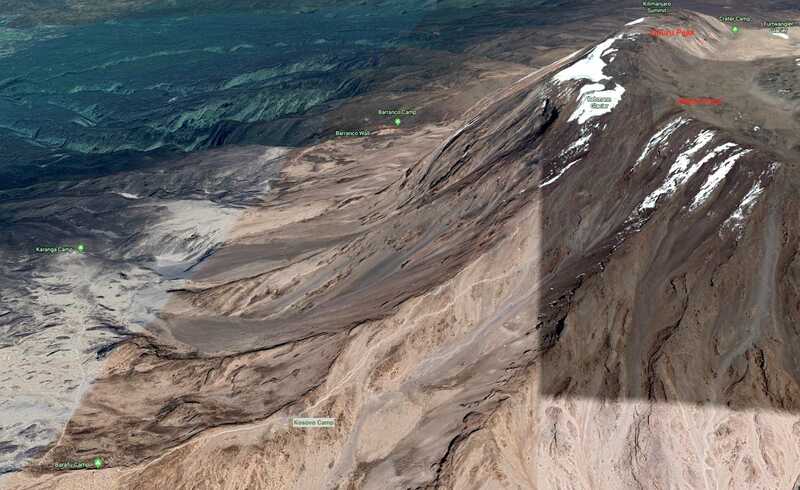 Fifty years ago there were glaciers on the southern slopes of Kilimanjaro with names like Diamond, Balletto, Heim, Kersten, and Decken. And now? Not much more than the glacial patch you see in the image above. 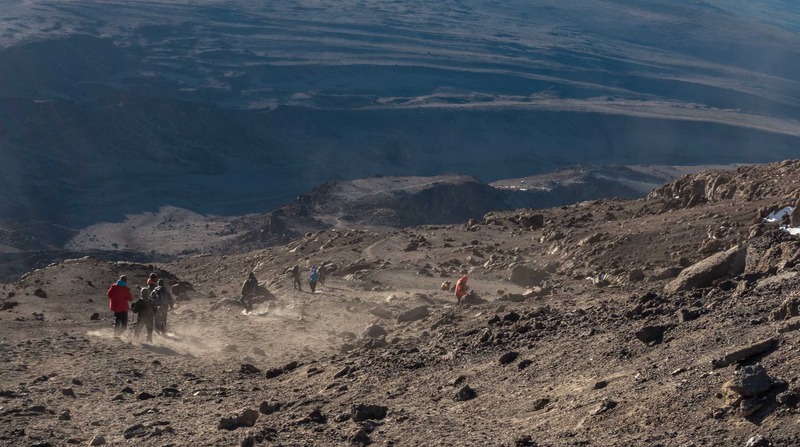 looking back to Uhuru Peak – our main guide Dixon coming down – 6:50 a.m. 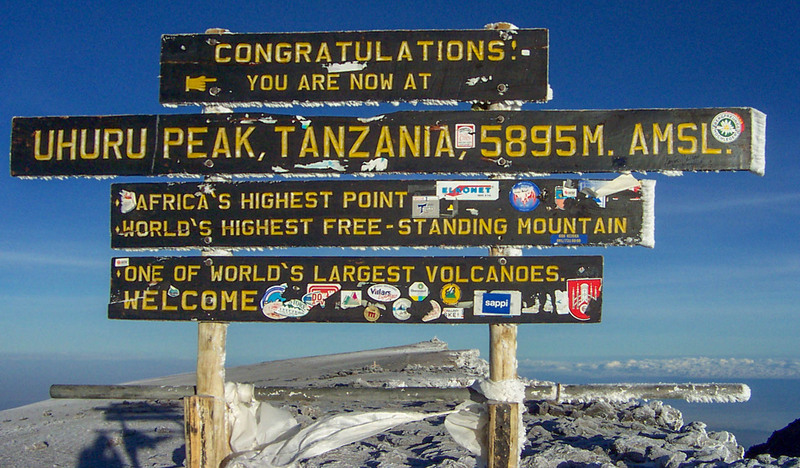 When we neared Stella Point on our descent from Uhuru Peak, I did turn back to the north and get the following shot. It shows some recent snowfall as well as what is left of the Furtwangler glacier on the middle left side of the image. I wish I had done a better job of documenting what is still up there. Here is an internet-sourced image of the section inside the box. It was taken in 2014 and the perspective is a bit different but it does capture the Furtwangler Glacier nicely. It looks like the Northern Icefield has receded somewhat over the past five years. as for the Furtwangler, it is losing some of its current 20-meter (65 ft) thickness each year. 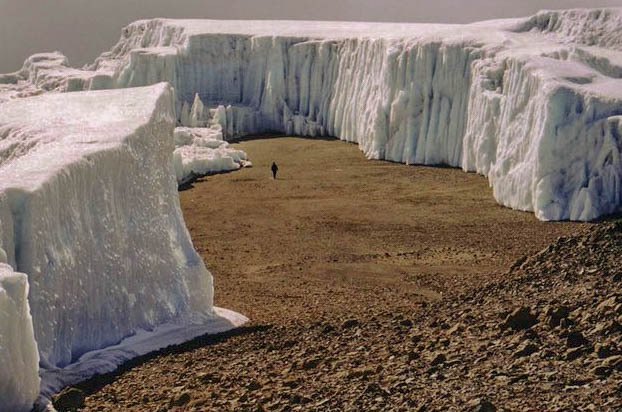 Note the person standing in the middle of the interior of the glacier! 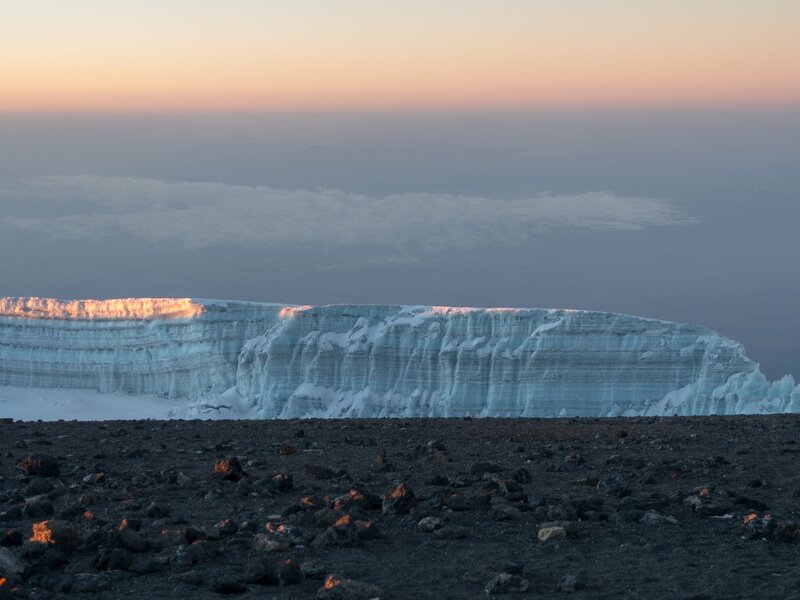 When I first considered the various routes up to the top of Kilimanjaro, I was attracted to one that included a night at Crater Camp, located not far from the Furtwangler Glacier. In the end, a trip report which highlighted the absolute mess of that Crater Camp has become thanks to lack of sewage disposal turned me off the idea. 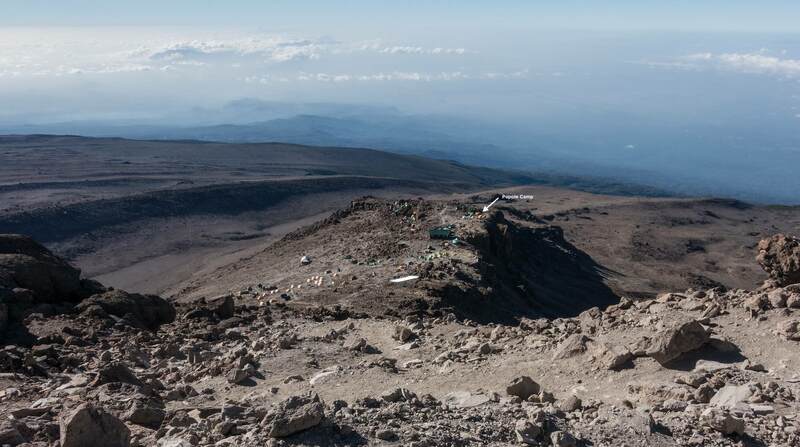 Also, if an ascent of Kilimanjaro is already fairly rapid by most mountaineering protocols, then a night at Crater Camp at 5700 meters was just compounding the problem. 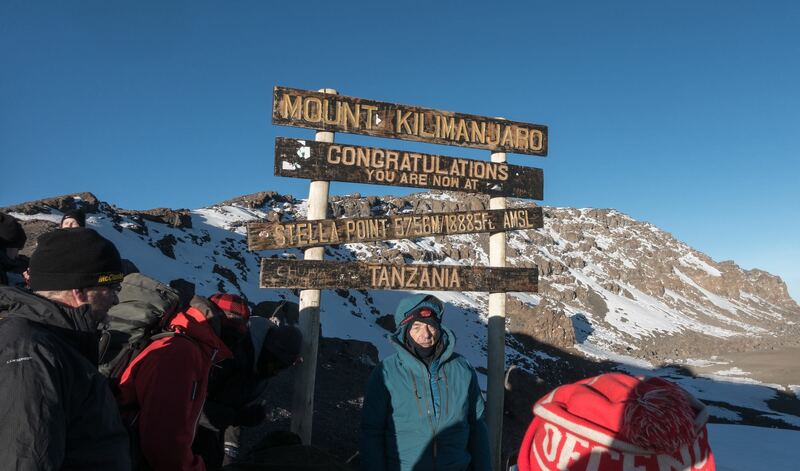 Stella Point signboard – time 7:00 a.m.
Like the signboard up at Uhuru Peak, this new copy of the old one has also replaced the unpopular yellow/green version that only lasted a couple of years. And then the descent. If walking uphill on scree is awkward, it is even more so on the way down. We would lose 1200 meters in 2 1/2 hours and eat a lot of dust being kicked up in the process. You have two choices – either get in front of the line so there is no one kicking up dust ahead of you or take a break every once in a while to put some distance between you and those ahead of you. I found the first option to be the better one! The photo below was taken perhaps fifteen minutes into our descent from Stella Point. 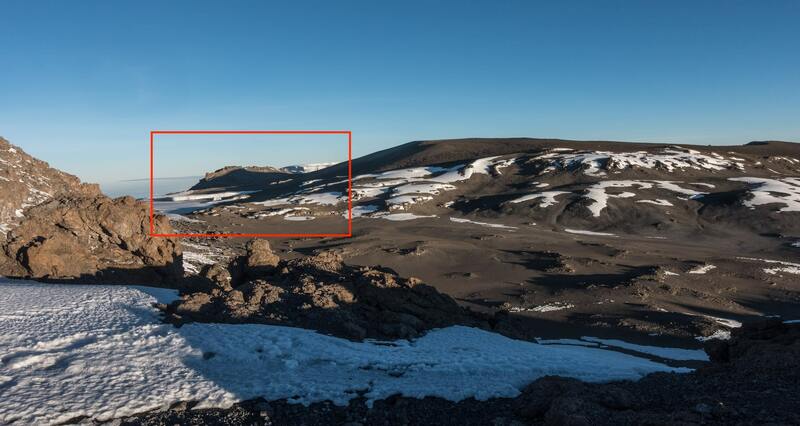 Already visible in the image is Barafu Camp, with its tents just to the right of the black bump in the middle. 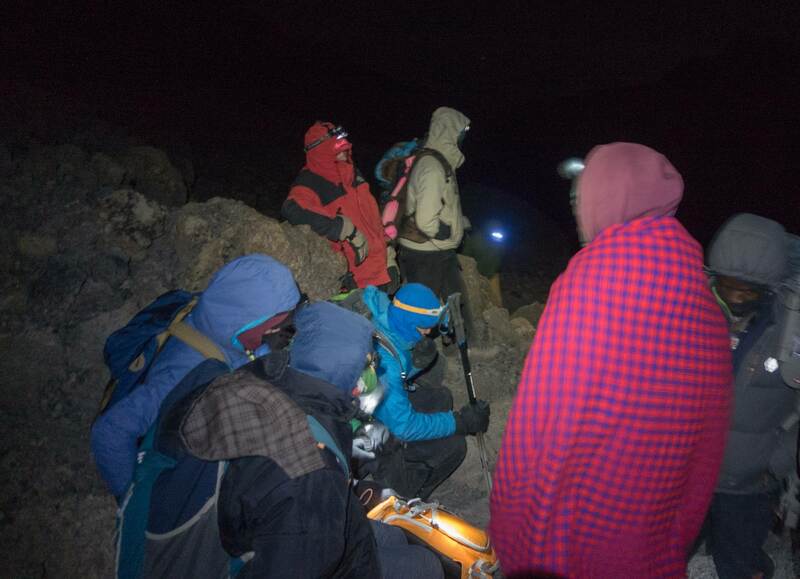 the return from Uhuru Peak to Barafu Camp – 7:04 a,m. On the way down I peeled off successive layers of clothing, top and bottom. It was a beautiful sunny morning on the slopes of Kilimanjaro, a lot different from the cold and windy early morning that we had spent on our way up to the crater rim. 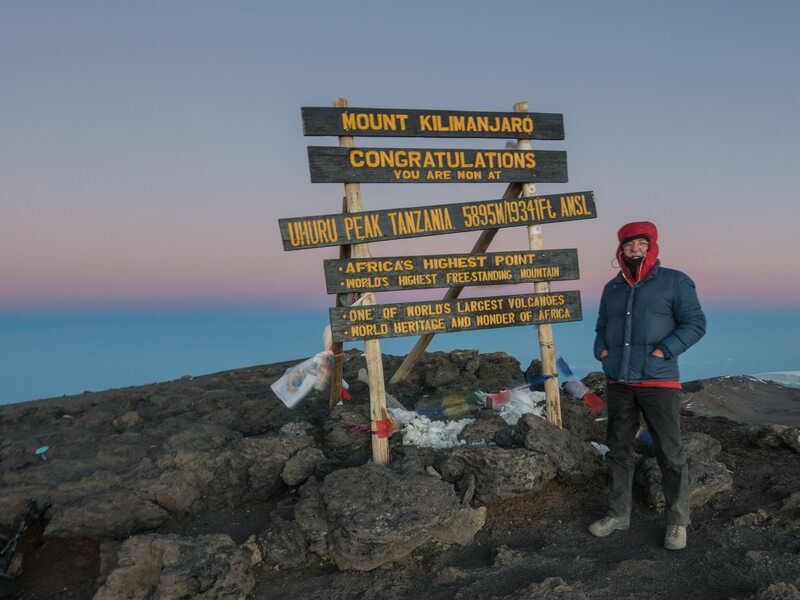 By 9:00 we were all back in camp, receiving congrats and a cup of juice from one of the porters who had remained in camp. The juice went down easy and it also reminded me that I had not had hardly anything to drink for the past nine hours! Before we left camp at midnight I had filled both my one-liter Nalgene bottle and my two-liter bladder with hot water. One liter of water weighs 1 kg. or 2.2 lbs. I had carried 3 kg./6.6 lbs. of water up the hill. Of that, I drank 1/2 a liter! Yikes! We spent a leisurely morning at our campsite, relaxing in our tent and basking in the sunshine. My boots and my base layers were draped on some flat rocks to dry out in the sun. My water intake also increased to make up for the past nine hours! The trail to the ranger’s hut and the registration book passed right by the Popote campsite. I watched as a large group of maybe twenty trekkers filed by. As I scanned their faces I was sure I saw a few that looked at least a year or two older than Mark or me! and then finish the trek the next morning. Our target was High Camp, increasingly the site chosen by trekking groups thanks to an accessible water source. 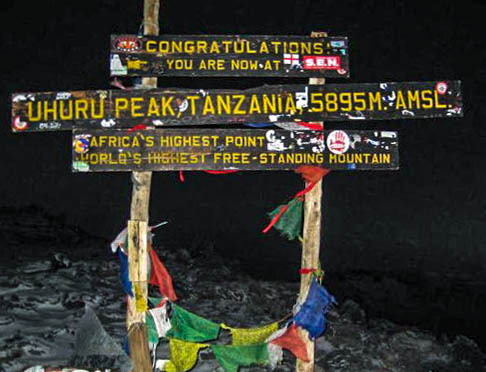 It doesn’t hurt that it is also an hour or so less far than Mweka Camp. At 6:30 a.m. we were at 5895 m; by mid-afternoon, we’d be at 3827m! Everyone was in high spirits as we set off. Someone commented – “Just think how we’d be feeling right now going down if we hadn’t made it to the top!” and all agreed it would hurt to have invested so much time and energy and money and not quite – for whatever reason – getting to the top. About twenty minutes into our afternoon walk, I looked back and got a shot of Barafu camp and then I seem to have put away my camera and just focussed on the steady downward path. 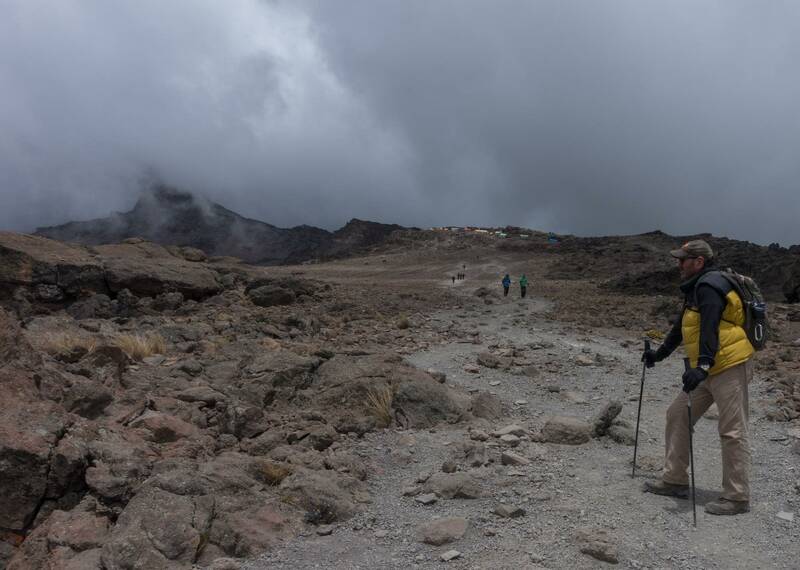 I had burned up almost 5000 calories getting to the summit and then returning to Barafu in the morning. The afternoon would prove to be much less stressful – though that 519 kcal figure seems much too low. Then again, it was a very easy walk! In any case, by 3:00 we were at High Camp and – as always – found the Popote camp all set up on our arrival. 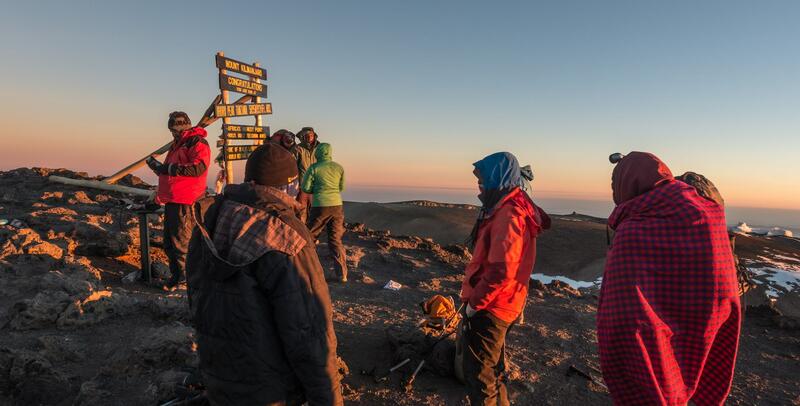 The majority of the crew who did not make the ascent had enjoyed a few hours of off-time at Barafu while their guests set off at midnight for Uhuru Peak. Now they had one more morning of hauling and their job would be done.